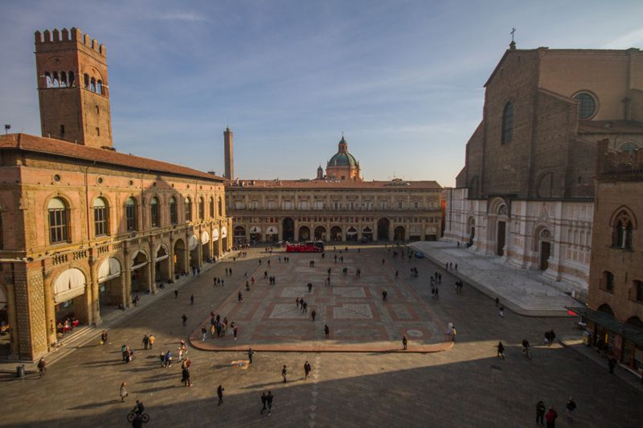 Seat of the most ancient University in the western world, Bologna, in Emilia Romagna, is a city with an intense cultural life and intriguing historical legacy. First an important urban center under the Etruscans, then the Gauls and Romans, Bologna was also a well-known Medieval city within Europe. A European Capital of Culture in 2000, it was declared by UNESCO to be a “creative and musical city” 2006. Among Bologna’s most important symbols are its famous porticoes, those covered sidewalks lined by colonnades that unite street, tower and palazzo. Just in the center the porticoes extend to approximately 23.6 miles. Also characteristic of the city are its towers, offering tourists the opportunity to to admire a marvelous panorama from on high, the most important being the Towers of Garisenda and Asinelli. The towers belonged to a complex of over 100 Medieval towers, of which only about 20 remain today, including Torre Accursi or dell’Orologio, dominating over Piazza Maggiore, and the Torre Azzoguidi. Azzoguidi is part of Bologna’s so-called “Triad of Medieval Skyscrapers,” along with Torre Prendiparte and Torre Galluzzi. The innumerable historic palazzos and edifices can make choosing what to see here difficult. Piazza Maggiore hosts three of them: Palazzo del Podestà, constructed c. 1200, and the first city government seat, Palazzo Re Enzo, completed right next to the former in 1244-46 which served as a prison and Palazzo Comunale or d’Accursio which is presently Bologna’s City Hall. Bologna also boasts several distinct churches, again beginning with Piazza Maggiore, where you will find the Gothic Basilica di San Petronio. Left with an incomplete facade, it still preserves precious works inside, such as Lorenzo Costa’s Madonna on the Throne. Working your way a bit east, you will find the Seven Churches in Piazza Santo Stefano, a sanctuary beloved by native Bolognese and non. Then, not far away is San Giacomo Maggiore, definitely worth a stop for its marvellous frescoes in the Bentivoglio Chapel. Finally, be sure to visit the Pinacoteca Nazionale or National Painting Gallery, a collection of works by the likes of Giotto, Raffaello, Carracci and the Archiginnasio di Bologna, seat of the ancient University of Bologna. 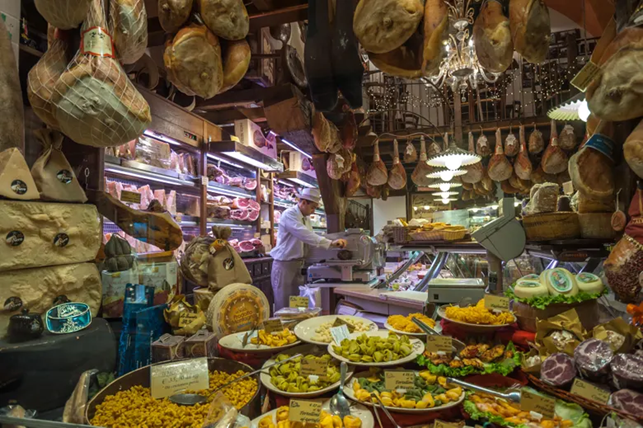 Bologna has several nicknames – la dotta (the learned) and la rossa (the red, from the colours of its bricks) but it is la grassa (the fat) that’s perhaps the most fitting. Food is a very big deal here, as it is throughout the Emilia-Romagna region – the home of Parma ham, balsamic vinegar and parmesan. Cured meats, aged cheeses, cream, butter, game and truffles abound in this most indulgent of cuisines – and autumn, with its plentiful porcini mushrooms and sweet chestnuts, is a great time of year to visit. Many of Italian cuisine’s heavy hitters – tagliatelle al ragù, mortadella, tortellini, lasagne alla bolognese – originate and are at their finest here.